Cosmo has traveled in-cabin on many flights of various lengths -- from two to nearly 10 hours. A little advance planning ensures Cosmo stays comfortable and stress-free throughout the entire trip. And while he's never had to relieve himself en route, we do have a strategy in place in case he does! We think it 'tis nobler to be prepared, so here you go... our tips for giving you and your dog peace of mind on a long airplane trip. Our Seven Tips to "Peedom From Worry on a Long Flight"
fleece in his carrier is a Dry Fur pad. during a layover or upon returning from a trip. Have the right stuff. The last time we traveled to Italy we purchased the small size Dry Fur pads and placed one underneath the pad in Cosmo's carrier. It's supposed to absorb all wetness and keep pets completely comfortable and dry in the event of an "accident." Cosmo's never had an accident in his bag, but we've kept it in place for extra assurance. Two pads come in a pack so you can replace the pad if one gets soiled. Bring some pee pads in your carry on. On our last long trip, I put a couple of these Wee-Wee Pads in my bag with the idea that if Cosmo seemed stressed, I'd take him to the bathroom on the airplane and spread one of these on the floor. Cosmo already was familiar with pee pads -- an important point -- because we used these when we lived in a condo. He's never needed them on any of our trips, but I still take these, just in case. Take it easy on food and water. Your dog has probably gone around nine hours or more at night without going to the bathroom, right? So a nine-or-so-hour flight is not an unreasonable amount of time to expect a healthy dog to stay dry. I do make sure Cosmo doesn't have gobs of treats the day before we travel. And for a long International flight, l I feed him a light meal at least six hours before flying. I also go VERY light on the water once we get inside the six-hour window. Maybe a few sips... or some people use ice cubes. I don't want to dehydrate him, but I do want him to be comfortable. Pets need to have a health certificate and all other sorts of paperwork from your vet for International travel, so you will want to make sure your pet is healthy and in good shape for this type of trip. Get to the airport extra early. Delta is recommending we arrive three hours ahead of time for an International flight. This actually works to our advantage. We can check in, and then have plenty of time to let Cosmo sniff around the dog park at Atlanta Hartsfield Airport. I also make sure Cosmo has time for some activity or a walk before we leave the house. That way he's ready for a nice, long nap. Sedatives? We don't use them. Cosmo is very relaxed and has no issues with curling up and sleeping in his bag. If you have concerns, check with your vet. Success for us is "in the bag." I've heard people talk about taking their dogs out of their carriers once they are on the airplane. I decided to try to open the bag "just a little bit" one time, and like a genie in a bottle, Cosmo wooshed out of the tiny opening and magically appeared in my lap in like .00001 seconds. The flight attendant yelled at us, and it was torture trying to wedge the wiggly fur ball back in the bag at a 90-degree angle. (Most airlines have regulations that require you to keep your pet secured in a carrier, anyway.) So once Cosmo is in the bag, he stays there until we get to our destination. He's never made a peep, and like I said, he sleeps the entire way. If you're comfortable with the situation, likely your pet will catch your vibe and feel comfortable too. Get comfortable with your carrier. Cosmo travels in a large SturdiBag , which measures 12x12x18, the maximum dimension allowed by Delta for a soft-sided bag. We like it because it's light, durable and easy to smoosh under the seat. Do make sure your pet is comfortable and familiar with the bag before travel. We wrote all about travel bag comfort here. 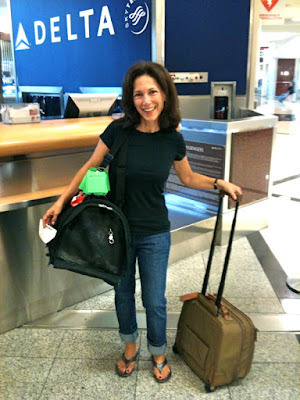 We consulted PetTravel.com many times before our first trip to Italy. We also bought our SturdiBag here. Fido Friendly magazine and blog has loads of useful travel tips. I recently learned about DreamofItaly.com travel newsletter and blog from editor/publisher Kathy McCabe. 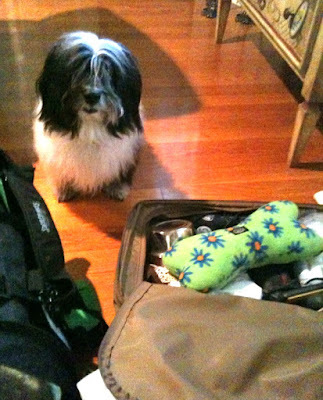 Dog Jaunt has tons of travel info about taking your dog on a plane and other great tips especially for small dog owners. GoPetFriendly.com and blog offers great tips to travel like a pro with your pet across the U.S. and Canada. Most importantly, know thy dog! Cosmo is very social and handles travel quite easily, in part due to his nature and in part due to preparation and endless training! Now, it's time to get packing! Wow, what a wonderful and informative post. I was actually - just last night - considering how Simba would do on a long flight, and some things I would need to keep in mind if I ever wanted to do so. Thank you!!! The benefits of having a trained dog are endless. A few months ago I started to train mine with some videos I found online. They teach you step by step! Aggression, anxiety, biting, barking and disasters in the house have disappeared. My dog behaves excellent. And I have taught many tricks! Hope you have a great flight Cosmo! Thanks everyone! We're looking forward to a great, pee-free trip!! Such great info! Cosmo sounds like a fantastic traveler. I wish Buster and Ty were small enough to fit under the seat. As it is, we'll have to stick to traveling by Winnebago. Thanks so much for the mention! I had my puppy take a syrup to make him fall asleep during a travel. It worked. Cosmo is a jet setter, I guess. Thank you for posting this! I found it very helpful as I prepare to fly with my dog from Thailand to San Francisco. Much appreciated. we like the fact that we've been taking advantage of the room. Great advice! Thank you for sharing. Its so important to get your pet comfortable with the carrier like you said. Ive been taking my pet for a cruise around town with her inside her carrier. Just to get her comfortable with being in contained while moving and tomorrow we'll be going for a little drive throughthe mountains so she can experience the ear popping when elevation goes up and hopefully not freak out. US Airways says its not good to give sedatives or anything because the pet needs to be able to balance their equalibrium and they cant do that when theyre sedated. Now im afraid to give her anything to calm her because what if she gets too relaxed and ends up passing out. She's a puppy. I didn't think I'd ever say this, but...my dog is finally FULLY trained! "The Online Dog Trainer " click: ( dogtrainercommand.com ) is a WONDERFUL resource for learning how to effectively and quickly train your dog without ever leaving home. I learned great ways to teach my dog almost every single trick imaginable and how to correct the most common behavioral issues, such as barking. It is full of carefully compiled videos that allow you to watch and listen to their expert solving the exact problem you’re having with your dog, with another real dog and its owner. You can see the precise body language he uses, how the tone of his voice changes, and how the dogs respond, changing their behavior almost immediately. It’s remarkable to see how quickly my dog picked up on these methods. My dog behaves PERFECTLY now! From what I understand, the information on that website works for any age or breed of dog. I feel blessed to know my dog is trained properly and effectively. Interesting blog and I really like your work and must appreciate you work for the Hands free leash. Click Modding My Salmon Alps, Have A Query About Lubrication. Dry cleansing is any cleaning course of for clothes and textiles using a chemical solvent apart from water It is used to scrub fabrics that degrade in water, and delicate fabrics that cannot withstand the rough and tumble of a washing machine and clothes dryer It might get rid of labor-intensive hand washing. Our diversified services be certain that we are able to provide full client satisfaction, whatever the mission. Using شركة تنظيف منازل بالرياض رخيصه water fed poles for window cleansing is loads quicker than using other access methods for window cleansing. We are really pleased with the professional, top quality cleaning companies now we have been offering for over 29 years to Preston, Lancashire, and the encompassing areas, including Leyland, Chorley, Coppull, Longton, Croston, Garstang, Goosnargh, Longridge, Freckleton, Kirkham, and Warton. The lens cleansing شركة تنظيف بيوت في دبي pen is Dry Activated Carbon Compound specially made for cleaning multi-coated lenses & filters. Instead of worrying about who might be cleaning your own home, you'll be able to concentrate on the benefits of an excellent clear based mostly in your preference cleaning plan. We have now invested in the latest, and one of the vital powerful شركات تنظيف منازل ابوظبي, extraction machine out there supplying you with cleaner and drier carpets. At Double Diamond Air Duct Cleansing, we recommend having your furnace regularly cleaned with each duct cleaning service. تمتلك شركة نقل عفش بالمدينة المنورة فنيين مختصون بتركيب عفش من سراير و طاولات و دولاب حيث تلعب الخبرة دور عظيم ب المحافظة على شكل العفش و المحافظة علية فى حالتة الجيدة كل ما عليك هو الإتصال بنا و نرسل لك مندوب لمعاينة حجم العفش و حساب التكلفة و مهما كانت النقلة ستنتهي بدون أن تشعر لأنك على وشك التعامل مع الشركة الأكبر و الأمثل بين شركات نقل العفش حيث تقدم لك الراحة و المصادقية فى تعاملنا اتصل بنا الآن لتعرف الأسعار المغرية المقدمة من قبل الشركة و اسئل على العروض و الخصومات اتصل على خدمة العملاء للإستفادة و للرد على جميع الإستفسارات. تستعين شركة تنظيف خزانات بالمدينة المنورة بأكفأ المهندسين و أمهر الفنيين المختصين في مجال تنظيف الخزانات و العزل و توفر أفضل العمال المدربين على أعلى مستوى تحت إشراف نخبه متنوعة من المتخصصين الخبراء في مجال التنظيف و تملك الشركة جميع المعدات اللازمه للقيام بعملية التنظيف بكل دقة و جوده و كفاءة و لدينا العمالة اللازمة للقيام بجميع أنواع العزل التي لها دور كبير و فعال في تنفيذ خدمات عزل الأسطح و الأسقف و الخزانات و تقدم الشركة أفضل خدمة لكي تكون الأفضل دائماً و للحصول على مزيد من التطور و النجاح فدائماً تسعى لتقديم الخدمات بأعلى كفاءه و مهارة و ذلك لخبرتنا الكبيرة في هذا المجال.